On Jan. 3, 2019, the 115th Congress will turn out the lights for good. Before that happens, we’re pressing Congressional leaders to take up some important unfinished business regarding land protection. Of course I’m talking about the permanent reauthorization of the Land and Water Conservation Fund. The Pacific Crest Trail Association and many others in the outdoor recreation and conservation communities have been urging this Congress to renew the program for the last two years to no avail. They are close, with bills in both the House of Representatives and the Senate passed by relevant committees. We now have less than 30 days to get it done — given the upcoming holidays, less than that, realistically speaking. 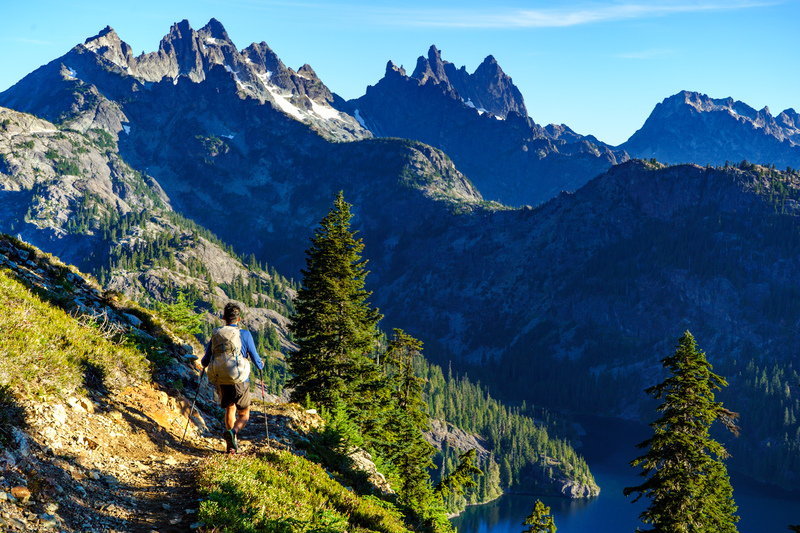 The Pacific Crest Trail in the North Cascades. Photo by David Xiao. The LWCF has been called one of the best conservation programs in the country. Congress created it in 1965, setting aside up to $900 million a year from lease payments made by companies drilling offshore for oil and natural gas. This money comes at no direct cost to taxpayers and is mitigation for environmental damage. The LWCF has purchased land in all 50 states. It has built serene parks and walkways along downtown rivers, and ballfields and playgrounds for children in inner cities. It has provided money to set aside property for national parks and wildlife refuges. It has saved sacred battlefields and other historic and cultural sites. It has protected forests and crucial wildlife habitat, including many special places along the PCT. Over the last 17 years, almost $36 million from the LWCF has been used to acquire and permanently protect about 23,000 acres along the PCT. 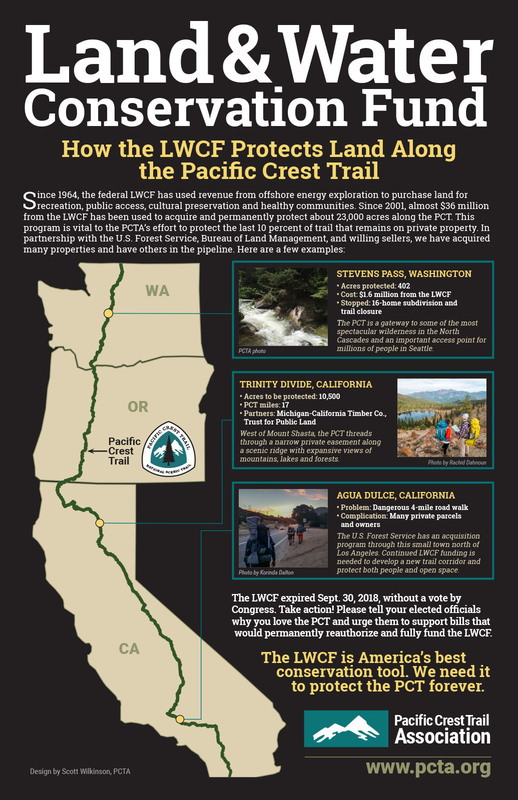 With 10 percent of the Pacific Crest Trail and a number of important nearby viewshed properties still owned by private individuals and companies, we’ll need the LWCF to fully protect the PCT experience for future generations. Caption for the poster image goes here. There is much at stake and members of Congress know this. Liberals and conservatives in both the House and Senate have worked together on a range of bills that will solve pressing issues facing our public lands, including renewal of the LWCF. We are heartened by their efforts. Enough members in both chambers have expressed their support for these bills to easily pass. It’s now up to House and Senate leaders to schedule the votes. Contact your Senator or Representative and tell them that you support the reauthorization and full funding of the Land and Water Conservation Fund. Urge them to press their leaders to bring the issue up for a vote.